And get these teenagers involved in other lodge activities. They can be servers at "Ladies Night" or have a special place at lodge fundraisers to sell their homebaked cookies. Have Rainbow Girl or DeMolay awards banquets on the same night as lodge night and make it an official, but open, lodge meeting. Get those non-masonic moms and dads into the lodge. Problem No. 2. . One of the most important problems we face is the retention of our present membership. Why are we not retaining our members, keeping them interested and attending their lodges and participating in the lodge’s programs? This is the most important area of renewal that we could consider. How often do any of the officers who are responsible for the health of the lodge, visit or at least call absent brothers? Being in touch with all members of the lodge should be essential, and not with just the monthly mailing of the trestleboard - though this is a very important tool. Personal visits, letters and/or phone calls can be of infinite value to the lodge. It would seem that this should be a responsibility of the Master and Wardens, particularly the Wardens, so that they can get to know the members of the lodge. Older Masons who cannot drive at night, should be able to be picked up and brought to lodge so that they can retain their interest. Problem No. 4. Ritual is a necessary part of the Masonic life. It cannot be ignored, but we can innovate some differences in rendering the ritual A lodge should have teams of members that are interested in ritual and be prepared and ready to perform their part of ritual. Not just the officers holding a particular position, but a ritualist can be called on to take part whenever a degree is to be performed. The lodge officers would have to be able to open and close their lodge and the Master and Wardens should be prepared to conduct meetings and to activate the programs that the lodge is currently working toward. It would always be the Master of the lodge that would conduct the meetings and he could do whatever part of the ritual he wished to perform in the degrees. It is still his lodge. Problem No. 5. Let us tell the world what we are doing and what part we play in the daily life of our community. 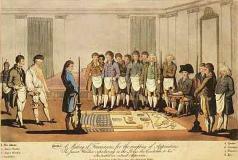 A member of the lodge could be designated as the liaison with the local newspapers, radio stations or t.v. stations or any other method of getting out the word. There is no reason why we cannot tell the world that Mr. Toby A. Mason has made application to our lodge and that he is looking forward to becoming a part of this great and world’s oldest fraternity. He will be receiving his degrees in our lodge on a specific date and invite all Masons to come and participate in this important occasion. An announcement of upcoming programs or charitable events or dates for the community blood bank, a childrens’ I.D. program, or whatever the lodge is sponsoring, should be included in the duties of the communications officer of the lodge. How else do we tell our community that we are here and are an organization operating for the good of all?